Take to the seas on a SUP big enough for you and mates! The ultimate Super SUP experience! Imagine you, your closest friends and one of our animated guides navigating a Super Stand Up Paddle Board around Newquay’s caves, caverns and crags. 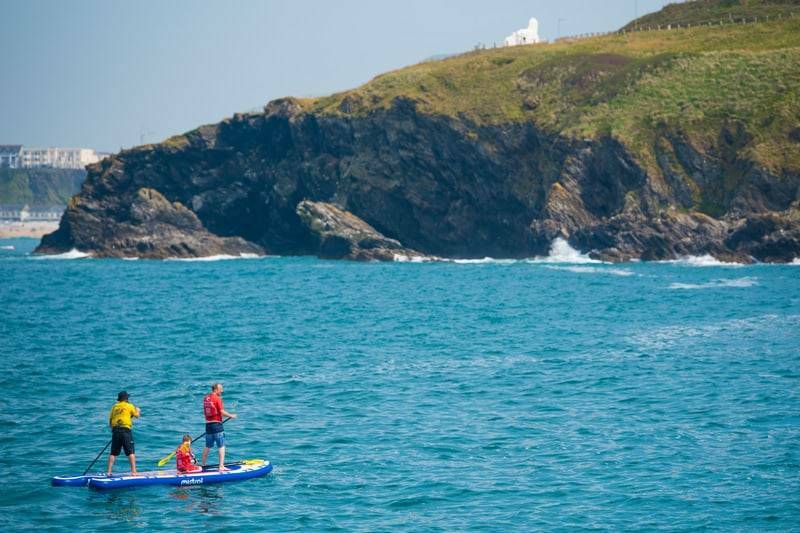 Exploring Newquay’s beautiful coastline, experiencing the magic of Fistral Beach and mooring up in Newquay Bay for a host of hilariously funny games (King of the SUP, Drunken Sailor and SUP Sumo) …well that’s exactly what we have in store for you on our Private Super stand up paddle board tours. You are the masters of your own destiny as the tour is private. You choose to spend more time cruising, investigating, leaning paddle technique, exploring or playing games. On private Super SUP sessions, with our safety guidelines you can call the shots! On meeting your experienced instructor, he’ll kit you out in a top of the range toasty warm wetsuit, buoyancy aid, helmet and pro paddle, and lead you down to the coast to launch the giant sized stand up paddle board. After a brief beach safety talk and fundamental paddle techniques, you’ll be ready to navigate this beast through the waters and out around the magnificent Towan headland. Along the way, you’ll discover secret coves home to our resident seal colony, paddle through ancient smugglers caves, learn to identify a myriad of marine and birdlife, practice paddle strokes, enjoy a workout like no other and negotiate radical swell on your return to shore. We guarantee endless giggles on our super stand up paddle board. What’s more, as it’s a private stand up paddle board tour you can go at your own pace; stopping off where you wish and spending more or less time on the activities you enjoy most (playing SUP games, watching wildlife, adventure touring or negotiating swells) …the session is all yours! For this reason the Private Super stand up paddleboard tours really lend themselves to birthdays, corporate events, stag & hen parties and other private celebrations. To find out more, check out our ultimate guide to Super SUP. Our reviews on Trip Advisor rank Newquay Activity Centre as number one for Cornwall activities and we’re proud double gold winners of the Cornish Tourism awards. Our Super SUP activities are unique to Newquay Activity Centre and will be an adventure to remember! Drop us a line or give our team a call and we’ll sort you out with the best activity for you, proper job! Call 01637 877722, lines open from 8am-10pm.